Australia’s own 5SOS (5 SECONDS OF SUMMER), one of the world’s biggest pop/rock bands, is thrilled to announce their return to Australia this August for the Meet You There national tour. 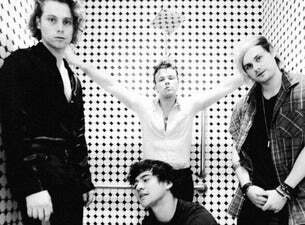 After selling out their 5SOS3 tour in less than 5 minutes, these all ages live dates will follow the release of their third album “Youngblood” on June 22 and will give fans the opportunity to hear new tracks ‘Want You Back’ and current No. 1 smash ‘Youngblood’, alongside old favourites like ‘She Looks So Perfect’, ‘Amnesia’ and more! Over the last six years 5SOS has played to millions of fans in arenas all over the globe and appeared on “The Tonight Show Starring Jimmy Fallon”, US “Today Show”, ‘’The Voice’’, “The Ellen Show” and more. Now, with new single ‘Youngblood’ tearing up the Australian charts – No. 1 on iTunes and Shazam, No. 3 on Apple Music, No. 4 on Spotify, and Top 5 on ARIA and a GLOBAL top 30 record - anticipation for this national tour is at an all-time high. ‘Want You Back,’ the first single from “Youngblood”, debuted at No. 1 on iTunes in over 18 countries and has amassed more than 93 million streams worldwide. Hailed as the “biggest new rock act in the world” by Rolling Stone, 5SOS is the only band (not vocal group) in history to see its first two full-length studio albums enter the Billboard 200 at No. 1. 5SOS’s self-titled debut album has sold more than three million units worldwide, with 1.5 million albums and more than 4.5 million single tracks sold in the U.S. alone. 2015’s “Sounds Good Feels Good” charted at No. 1 in 12 countries, including Australia, the U.S. and the U.K. ‘She’s Kinda Hot,’ the album’s first single, topped the iTunes charts in 44 countries. 5SOS – comprising Luke Hemmings (vocals/guitar), Michael Clifford (vocals/guitar), Calum Hood (vocals/ bass) and Ashton Irwin (vocals/drums) – has won an American Music Award, a People’s Choice Award, an iHeartRadio Music Award, five MTV European Music Awards, two ARIA Awards and an MTV Video Music Award.